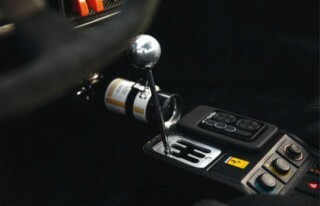 Feature Car Ferrari 328 GTS. This isn’t just the ultimate build, it’s the ultimate story of succeeding at life. Mitchell Button is a young man with an old soul. 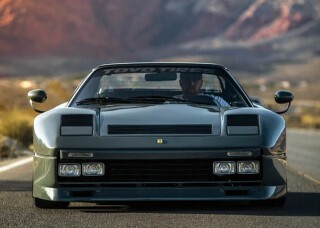 When his custom Ferrari 328 targa blew the roof off SEMA, he was happy to absorb the derision of the purists. Because this unique build is about so much more than petty egos… Words: Daniel Bevis Photography: Mike Kuhn. There’s an aura that surrounds the ownership of a Ferrari. It’s not a car you just fall into owning. It’s a dreamlike entity offering endless visceral thrills and demands deep pockets. So you might think having a custom Ferrari would be the ultimate expression of cash-rich hedonism. But don’t be so sure. “Ferrari – remember that name, Son,” Mitchell Button’s father told him when he was just a kid. “Not because of the car, but because the people who drive them don’t wake up every day with decisions of either paying rent or feeding their family”. A hard-working, blue collar guy, Mitchell grew up with the importance of earning your way in life and keeping dreams alive hard-wired into his very DNA. And while many feature car owners we talk to have an endearing tale to tell about what they drive because their dad used to have one, Mitchell’s story has a rather steelier edge. With troubled family situation Mitchell had to fight from day one finding solace in the few positive life offered him. His father’s work ethic was instrumental, and Mitchell found himself earning pocket money from spraying cars in a plastic-screened trailer porch. His old man’s mechanical affinity meant Mitchell was exposed to all elements of car maintenance and modification from an early age, and it’s this that informed the direction of his life. “I began building and modifying scale-model cars, and turned my tiny room into what would now be considered a giant diorama,” he recalls. “I had a vision for each build, but would often leave these cars in primer on scaled-down jack stands, because the process is what I valued most. Enjoying a finished build is incredible, but for me the true beauty is in the journey and I realize now why I found it difficult to pass that phase in my early years. The Ferrari 328 you see spread across these pages, then, is no chequebook SEMA build. This is therapy and the achievement of a lifetime ambition. Button Snr was a man who would never take something that wasn’t earned and never ask for something that wasn’t deserved. So when Mitchell came home from school one day aged 14 to find him and all his belongings gone, he knew the fibre of the family had also taken flight. Our hero left home at 15, set to grafting in the auto industry. He bought himself a Mercedes-Benz 190E W201 at 16 and kept striving onward and upward, buying and selling cars and making a name for himself in the automotive world. That advice about Ferraris reverberating in his brain. Enzo Ferrari became Mitchell’s de facto role model. 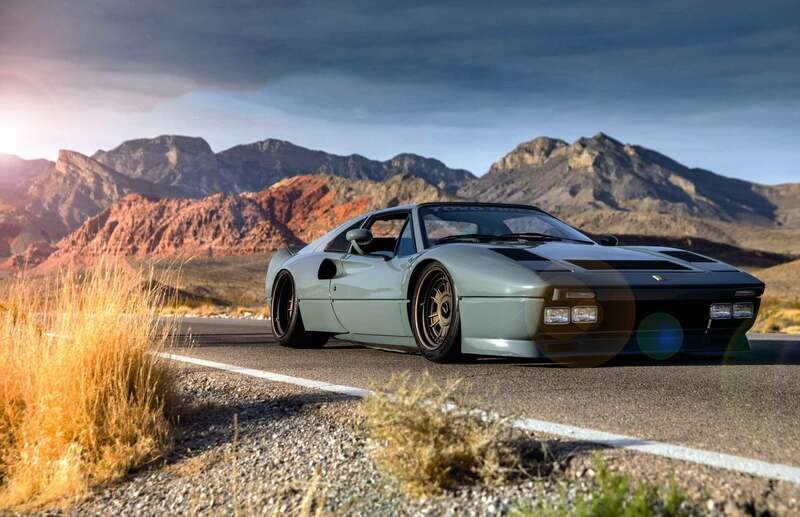 Mitchell assembled a tight cast of characters, each A trusted and talented friend, to aid him in fulfilling his vision – and the element that really leaps out at you from the finished build, as those genuine 288 GTO foglights stare you down, is the aggressive widebody aesthetic. Custom-crafted from carbon-Kevlar, the body conversion is respectful to Pininfarina’s original lines, but no stone has been left unturned: the bespoke panels comprise the front wings, bumpers, bonnet, rear quarters, rocker panels, ducktail spoiler, and even a one-off targa panel. It’s all slathered in Ferrari Grigio Medio paint because that’s what Enzo would have done. Although what’s really got the Tifosi frothing is way the thing now sits. Makes sense. And did you get a load of those wheels? Developed in conjunction with Rotiform, the DNO was designed just for this car, based in the Dino’s Cromodora wheels that few enthusiasts ever Really liked; the expertise of Rotiform has turned that ugly duckling into a glorious swan – and there’s even a matching spare wheel built to the same size as the original spare! The theme throughout the project has been one of high-end restomodding. Mitchell’s paid close attention to what Singer have been up to with their Reimagined 911s. 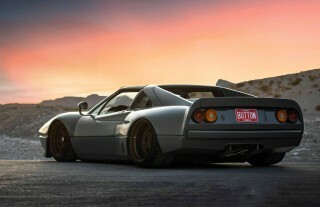 And that’s precisely the effect he wanted – something that respects the car’s heritage but moves it into the modern era. With flawless attention to detail, and round 400bhp, thanks to ITBs and some clever management, we’d say Button Built has ticked that box with gusto. Mitchell is philosophical about the scale of his achievement, in the wake of a phenomenal worldwide reaction to the BB328’s SEMA debut. “We live in Los Angeles and since California is blessed with beautiful canyons we take advantage to stretch the car’s legs,” he smiles. 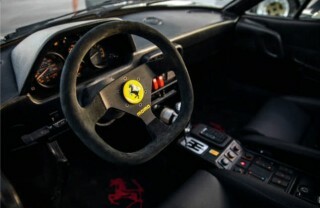 “A Ferrari becomes more beautiful as its rpm climbs, so we feel most grateful when we experience its true potential. Apart from the music it creates carving canyons, the aesthetic is extremely humbling, and we love parking outside our favourite Beverly Hills breweries and enjoying a pint as we remind ourselves how fortunate we are to take part in such a beautiful history. 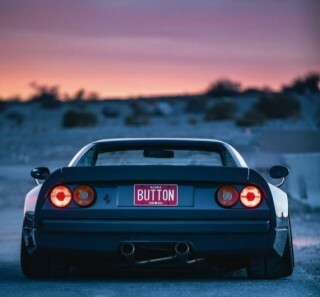 That sums up the Button Built 328 perfectly. This was never about Insta-fame. This car is therapy, and karma, and just reward for hard work and passion. Mitchell isn’t your typical Ferrari driver. But he’s just the sort of driver Enzo would have respected. 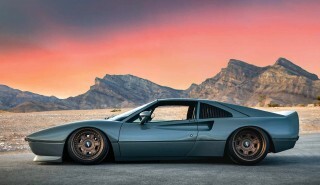 STYLING Grigio Medio paint; custom carbon-Kevlar widebody conversion – including front wings, front bumper, bonnet, rear bumper, rear quarter panels, rocker panels, targa top and ducktail spoiler; genuine 288 GTO foglamps; genuine 458 GT3 carbon fibre mirrors; custom two-piece aluminium diffuser with hidden hardware; original badges and emblems powdercoated to match wheels. TUNING F105CB 3.2-litre V8; Bosch K-Jetronic electronic fuel injection; custom stainless exhaust manifolds; custom straight-through exhaust system with upswept megaphone tails; Jenvey IDF individual throttle bodies on Weber IDF manifold; Electromotive ECU; 400bhp @ 9,200rpm; gated manual transmission. CHASSIS Custom 9.5x17in (front) and 12.5x18in (rear) Rotiform DNO wheels in Matte Death Bronze with satin black hardware (and matching 3-piece spare wheel built to dimensions of original spare); 235/40 (f) and 295/30 (r) Toyo R888R tyres; custom air-ride system with fully adjustable tubular A-arms and control arms; custom reinforced subframe; JRZ struts; Endo-CVT tank and AccuAir e-Level management; Wilwood lightweight racing big brake conversion with 2-piece floating discs. INTERIOR Bride Histrix carbon-fibre seats; MOMO flat-bottom Alcantara steering wheel; killswitch and extinguisher. Some snobs reckon that Mitchell’s ruined a Ferrari here, but that’s an unfair analysis. He’s no purist, sure. But he’s a proud and fastidious historian. “While I deviated from Ferrari’s original design, I remained true to the real spirit of Maranello in each detail of the build,” he assures us. “The paint is an original Ferrari colour that I first saw on a 275 GTB. While the seats are reminiscent of the styling found on the 288 GTO – only with no headrest, to allow visibility through the rear window. The original Dino Cromodora wheels were my inspiration when I teamed up with Rotiform to create the DNO; I wanted to amplify the Dino-style face by adding three-piece construction with a 330 P3-type step lip. The Matte Death Bronze finish was inspired by the race-battered magnesium wheels of the 330 P3! “The air-ride was engineered to be both functional and aesthetic, to properly enjoy the car for what it was meant for – driving. While the lines of the 458 GT3 mirrors are very modern, they mesh well with the curvature of the body, which makes them appear period-correct. 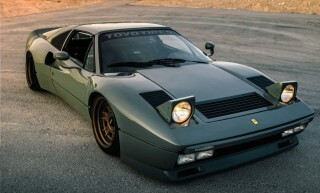 And the exhaust and headers were inspired by the 308 GTB rally cars and the race cars of the ’80s that inspired many of us to be the compulsive creators we are today. And powdercoating engine parts, badges and interior parts to match the wheels was important to keep a consistency.” You see, while some may view this car as an act of vandalism, it’s actually been carried out with the utmost care and respect. Inspiration for this project: Ferrari Enzo himself So, you’ve built your dream car here? Sure have. That said, this build was a dream but it was not my goal. My goal was hidden among the reactions to the build and only revealed in the days following its debut. And how do you feel about people’s reactions? It’s easy for someone who considers themselves a purist to ride the bandwagon and disregard the rationality of various aspects of this design. However, the difference between a true purist and one who believes they earn the title is experience. We can’t speak upon things that we have no first-hand knowledge of. Indeed. So how does it feel to finally see your own Ferrari in print? Amazing – thank you and everyone involved for your interest in this build and for allowing me another outlet to share its story! I firmly believe that print media will always be the only true outlet to immortalise a build. And I’m happy that you guys will be the first print feature following our debut.